There are Christians in the world who choose not to drink alcohol for a variety of reasons. I understand and respect that. And then there are those who think that Christians shouldn't drink because they claim it is a sin. One of the more difficult passages for those in the second group is Jesus turning water into wine in John 2. The thought of the Messiah using his powers to provide an intoxicating beverage just doesn't sit well with them. Often they will refer to it as "new wine" by which they mean alcohol free. The video clip below was sent to me by a friend. I am not sure who the speaker is, but he can sure preach. Too bad his facts are wrong. Again, I respect that he doesn't want to drink alcohol. But calling it a sin (something the Bible doesn't do) and suggesting that Jesus made non-alcoholic wine is just plain wrong. There are several ways that I could answer him, but I will use just one passage. In Deuteronomy 14:22-27 some regulations for tithing are laid out. In 14:23 the reader is told to use their tithe (watch this now) to buy grain and new wine to drink where the Lord commands. Now it is true that the Hebrew word in 14:23 means "new wine" or "fresh wine." It is a rarely used word for wine and carries with it connotations of ritual. But that doesn't necessarily mean non-alcoholic wine. One problem that has to be taken into consideration here is how would one keep grape juice from spoiling in the heat of Palestine? Certainly some portion of grape juice was probably drank when it was first squeezed and thus non-fermented. But without refrigeration and stabilizers the process of fermentation would begin to settle in on its own. Grape juice will either ferment or spoil. Thus the ancients had to make wine to keep it from becoming vinegar. But let's say, for the sake of argument, that new wine in 14:23 does refer to unfermented drink. What then are we to make of what we are told about the tithe in 14:26? There we read that if you are too far from the temple to enjoy your tithes you are to go out and buy "wine and strong drink" and to "rejoice in the presence of the Lord." In this case there is no getting around it. The word for "strong drink" is the same one used in Gen 9:21 to describe what Noah drank when he got drunk. And both words for wine and strong drink are used in 1 Sam 1:15 when Eli thinks Hannah is drunk. So while I am not suggesting the author of Deuteronomy is telling us to use our tithes to get drunk (something Bible does condemn) I am saying that we are told to spend our tithe money on a good bottle of wine and/or beer or even scotch and enjoy it in the presence of God. So if the preacher above doesn't want to drink that is his choice.But he should not suggest that Jesus never drank or that he only made non-alcoholic wine. Equating Jesus with a bartender seems to be an attempt to not just marginalize those who drink but also those who serve drinks. But the gospels I read seem to locate Jesus frequently in the presence of bartenders. For myself, I think I will use some of my tithe money! 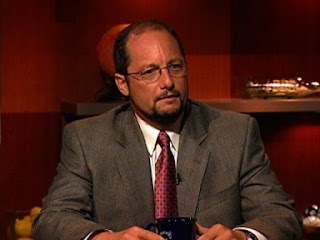 Why Christians should be thankful for Bart Ehrman. Bart Ehrman is a favorite target of conservative scholars. And it's not like he hasn't earned some of their scorn. As a graduate of Moody Bible Institute and Wheaton College, Erhman is the epitome of scholarship gone wrong (at least for some). He has abandoned his conservative background and openly admits that he is now agnostic. His books have become a source of irritation for some, and his television appearances, as he seeks to reveal what he believes is the real story behind the Bible. Conservatives fear him to such a degree that they have established the Erhman Project, a web site dedicated to responding to his claims. I think if I was Ehrman I would consider that a badge of honor. I admit that I am not always fond of his work. While I tend to agree with much of what he says as regards the data we have, I am often at odds with him in regards to interpretation. I wish that he was a bit more balanced in his approach to the various topics. At the same time, however, I also have a lot of respect for him. He is clearly well informed and at a minimum he is getting people in the church to talk about the topics he raises. If you want an example of his knowledge and intellectual abilities watch the debate he participated in with Dan Wallace regarding the manuscript evidence for the New Testament. While Ehrman may be the person we love to hate, I think he won the debate handily. In spite of his "pariah" status with some, there is reason Christians should be thankful for Ehrman. Over at the Christian Post Robin Schumacher has outlined why Christians need to take a step back and realize that not everything Erhman has to say is negative. In fact, some of his points help bring an important corrective. It may sound odd for a Christian to thank Ehrman for some of the things he says, but in fact, Ehrman does deserve credit in a number of places. First, Bart’s advice on examining evidence regarding truth claims is a good one. Even though he is somewhat selective on what cats he decides to let out of the truth bag for readers to consider in his books, his admonition to put belief systems to the test is spot on. Moreover, Bart also validates the historical lives of the disciples, Paul, and their claims about seeing Jesus alive. Of course, he denies Christ actually rose from the dead and offers a variety of explanations for what Paul and the other apostles experienced, but he doesn’t deny that something happened to change each of them into defenders of Christianity. We also need to thank Bart for openly calling out and educating the Church on passages in the Bible that the vast majority of theologians recognize as not being part of the original canon. The longer ending of Mark (16:9-19), the section of the woman caught in adultery in John (7:73-8:11), and the 1 John 5:7-8 Trinitarian formula still found in a few Bible translations are all considered inauthentic by most Biblical scholars. Ehrman is right to remind believers of this fact. Of course, nearly all Bibles clearly omit or mark these passages as suspect in some way, and skeptics should understand that it is through the science of Biblical criticism that such verses are classified as not being known by the early Church nor inspired by God. Bart is certainly not the first to bring these passages to light. Lastly, I appreciate Bart’s honesty in the interview where he admits that it is the logical problem of evil that has turned him from belief in God vs. any supposed errors in the Bible. Many unbelievers cover the true source of their disbelief with various smokescreens, but I am impressed that Ehrman does not do this. You can read the whole post here. Schumacher goes on to discuss points where Ehrman and Christians part ways, but overall it is a thoughtful post that is worth considering. Why did Protestants stop reading the Apocrypha? Because they wanted cheaper Bibles. In 2011 Ashland Seminary hosted a series of events celebrating the 400th anniversary of the King James Bible. Part of that celebration included setting up a museum in which we displayed various manuscripts and Bibles dating back over 2,000 years. Included among the items on display was a page from a 1611 King James Bible. But the page was not from an Old or New Testament book, but was from 1 Maccabees, one of the books contained in the Apocrypha. When people touring the museum saw this they were usually quite surprised. They didn't realize that the Apocrypha was part of that Bible. Today, most protestant Bibles do not include the Apocrypha and few have ever read the Apocrypha. But history reveals that the Apocrypha has been a part of what we call the "Bible" longer than it has not. For example, the earliest most complete Bible discovered at the monastery on Mount Sinai (Codex Sinaiticus) contained the Apocrypha as well as a number of other books that were and are, in general, not considered canonical. The evidence of the 1611 King James shows that while the Bible has expanded and shrunk over history, what we commonly call the Apocrypha was usually a part of the Bible. Yet, the situation today is such that finding an English language Bible with the Apocrypha is the exception to the rule. But why is that? Was it because Protestants finally got their theological house in order and excised the spurious books? Nope! It appears that the decision was influenced more by economics than theology. Over at the Anxious Bench Blog Philip Jenkins has a good post on the history of the Apocrypha and how it was eventually removed from most Protestant English Bibles. English-speaking Protestants lost the Deuterocanon not through any calculated theological decision, but through publishing accident, and at quite a recent date. 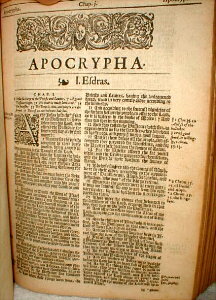 Prior to the early nineteenth century, Anglo-American Bibles included the apocryphal section, but this dropped out as printers sought to produce more and cheaper editions. Increasingly too, during the nineteenth century, anti-Catholic sentiment encouraged Protestants to draw a sharp line between the two variant Bibles. If Catholics esteemed books like Maccabees and Wisdom, there must be something terribly wrong with them.